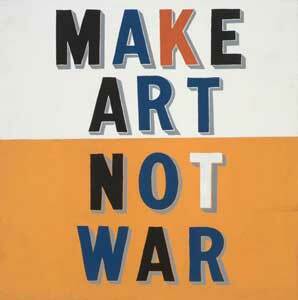 Patrick Brill, better known as Bob and Roberta Smith, is out to change the world with his most recent political statement, his Art Party of the United States. As a contemporary political artist, Brill has decided it’s time to take his conversational artworks and use them to fight for the continued, even heightened, importance of art in our ever-confusing modern political context. By creating the Art Party of the United States, Brill plans to take his art revolution across the US, one state at a time. Brill will be giving a talk on his art revolution at Crunch art and philosophy festival at Hay-On-Wye on November the 18th to November 20th. The festival will also be showing another talk session with Bob and Roberta Smith called I Should Be in Charge, in which John Rogers’ documentary asks the question of whether art really can save democracy. What is the future for Brill’s public art revolution? How powerful can art be when in comes to inciting political change? If you want to know the answers to these questions, head down to Crunch festival and hear why Patrick Brill is fighting for the idea that “all really good art is political. It can be aggressive and obvious or it can be quiet. All art should be brutally uncommercial and totally uncompromising”. If Brill’s valiant push for an art revolution isn’t enough to get you to Hay-On-Wye for Crunch, you’ll also get to see speakers like Mark Haddon, author of The Curious Incident of the Dog in the Night-Time, Hans Ulrich-Obrist, co-director of the Serpentine Gallery and Jake Chapman. With three days full of talks, debates and lots of good live music, this festival will definitely not be one to miss.